Secretary General of the Inter-Parliamentary Union (IPU), Anders B. Johnsson has written to the Speaker of the Majlis proposing an urgent delegation be sent to the Maldives. “We are concerned that these recent developments and the continued polarisation of the political situation might imperil the Maldives’ fledgling democracy,” wrote Johnson to Speaker Abdulla Shahid. “I propose that an IPU delegation returns urgently to the Maldives to discuss and agree with the relevant authorities and stakeholders effective steps to ensure that the parliament can fully discharge its legislative and oversight functions freely and independently and that its members can do their work unhindered, without fear of intimidation and harassment or attack on their physical integrity,” added the Secretary General. The letter obtained by Minivan News, dated October 25, was prompted by the Supreme Court’s decision to strip two MPs of their seats last week. Following the Majlis’s rejection of the court’s ruling, MDP MP Ali Azim’s was arrested after scuffles with the military as he attempted to enter the parliament on Saturday. His detention has subsequently been extended for 15 days. Johnsson’s letter also included the full text of the IPU Governing Council’s recent resolution which expressed concern at “reports of alleged arbitrary arrests, attacks and harassment of MDP members of parliament”. The resolution, adopted earlier this month, listed 21 cases of Maldivian MPs already being monitored by the IPU with the addition of three new cases. The IPU General Council “is alarmed at the climate of confrontation spawned by the first round in the presidential election.. [and] is deeply concerned that parliament’s authority is apparently once again being challenged in the current political crisis,” read the resolution. All MPs listed by the IPU – barring murdered Progressive Party of Maldives MP Dr Afrasheem Ali – are members of the opposition Maldivian Democratic Party (MDP) which has described the prosecution of its MPs as a “purge”. “The urgency and seriousness of the current situation warrants an urgent on-site mission by the Committee, so that it can gather first-hand information on the allegations and ascertain the prospects for their examination and clarification in the current political situation in the Maldives,” read the IPU resolution. The MDP last week linked the “intimidation and harassment” of its MPs to crucial votes in the Majlis concerning the imminent transition of presidential power as well as no-confidence motions against senior members of the cabinet. The MDP’s recent alliance with the Dhivehi Rayyithunge Party – one of whose MPs was unseated by the court’s recent ruling – has given it the support of a majority of the chamber. A motion to allow the Speaker of the Majlis Abdulla Shahid to assume the presidency following the expiration of the current term on November 11 was passed yesterday, in spite of the abstention of all government aligned MPs. Today’s scheduled no-confidence motion against Attorney General Azima Shukoor was delayed after the AG informed the speaker that she was unwell. The three new cases noted by the IPU General Council concerned Ali Azim, Alhan Fahmy, and the Speaker Shahid. The list also included fresh allegations concerning MPs Hamid Abdul Ghafoor, Ali Waheed, and Eva Abdulla – the Maldives’ first member of the IPU. Eva was arrested briefly during protests against the Supreme Court’s involvement in the annulling of the presidential elections earlier this month, whilst the IPU also resolution expressed shock at reported death threats against both Speaker Shahid and MP Ali Waheed. More recently, Ghafoor has sought protection from arrest in the parliamentary premises following a police summons to attend hearings into drugs and alcohol charges. US ambassador Michelle J. Sison yesterday met with Shahid and Hamid, whilst US diplomat Christopher Teal called for an end to politically motivated arrests. Less than 48 hours is left before the ballot boxes open. On Saturday (September 7), the Maldives will choose its next president. The personalities and policies of four presidential hopefuls may differ from each other, but all do share one thing in common – they are all men. And where are the women? They are standing behind their men. Though no woman has a spot in the presidential race – dominated by four male candidates and their running mates – women have undoubtedly become an inextricable part of the elections. As campaigning intensified over the past months, women and girls have been busy sewing more flags than they can count, cooking massive pots of Bondibaiy (sweetened rice) and spicy fish to quench the hunger brought on by mass rallies, and walking day and night to knock every door in order to win votes for their candidates. Women are also seen taking the front line at every political demonstration or march around the island – donning blazing yellow burqas, glittering pink t-shirts, or bright red blouses – colours synonymous with their candidate’s parties. Without the female presence, political events would have neither the same magnitude nor diversity as currently seen. Participation of women of all ages is a highlight of this, the second ever multiparty presidential elections to be hosted in the country. Out of all the major political parties contesting in this year’s elections, the Maldivian Democratic Party (MDP) stands out in particular for the scores of women that are participating in party’s events. The MDP is contesting to regain power, following the controversial end to its three year old government after the resignation of former President Mohamed Nasheed on February 7 last year. The party vehemently contends that Nasheed was forced to resign in a coup. In the wake of Nasheed’s resignation, massive protests led by his supporters against the new regime were suppressed using force and dozens were severely injured in the process – many of them women and girls. 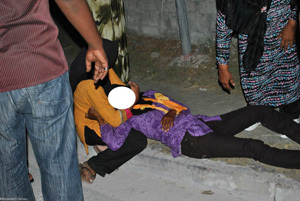 A peaceful sit down demonstration by MDP female supporters outside the President’s Office was dispersed with water canons, while several women were beaten on the southern atoll of Addu – where women took the streets to protest against what they call a “coup government”. 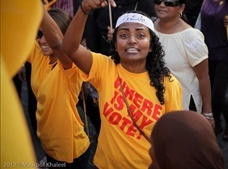 But, since February 7, female supporters of Nasheed have braved their way against pepper spray, batons and water cannons and continued to take lead in an army of yellow supporters, determined to fight till end to bring Nasheed back to power. Shauna believes that this unwavering support by women is a result of policies adopted by the MDP’s short-lived government which mostly “benefited women”. “If you look into the social protection program over 100,000 people directly benefited from it. It was largely spent on elderly, single parents who are mostly women. Also programs such as Hunaru [vocational education] and Second Chance program [rehabilitation and reintegration of inmates] largely accepted by women because, although women do not bring income to the family, its women who make household decisions and look after the elderly parents, take them to hospital and look after the children. So the person who really understood and felt the benefits of these programs were women,” Shauna observed. During the campaigns, two out of four presidential candidates have announced women specific policies; including daycare centres, flexible working hours, online jobs and reserved seats, among other things. Though MDP claims to hold the policies benefiting women, the party is one of the two that has not prioritised a policy towards achieving gender equality and improving women’s rights- one the few remanining development goals the country has so far failed to achieve due to widespread violence against women and low representation of women in political and economic life. Second is Jumhoory Party’s Gasim Ibrahim. The party speaks of introducing a pregnancy allowance and ensure gynaecology services on every islands as policy on women. For a party backed by Islamist party Adhaalath which believes in strict enforcement of Sharia and patriarchal dominance within public and domestic spheres, having no progressive policies on women is unsurprising. But why does MDP, a party which asserts to be an alternative to the rest, holding egalitarian and moderate views does not have a policy specifically aimed at women? The party has never been recognised for its suitable policies for women. In fact, MDP’s record of gender policies during its short-lived three year term does not score well either. Take the issue of domestic abuse and gender-based violence in the country. With every one in three woman estimated to be a victim of physical or sexual abuse, it is one of the biggest challenge women face across all islands. However, Nasheed’s government and its parliamentary group failed to step up in bringing any necessary legal reforms while its rivals were instrumental in drafting, promoting and passing domestic violence and child abuse legislations. Unemployment among women is double that of males, however, no day care centres, flexible working hours or economic policies specifically targeted to reducing female unemployment were introduced. Research suggests reasons behind female and male unemployment differs with young women finding more difficult to find work due to early marriage, household responsibilities, societal attitude. Maldives holds the record of one of the highest divorce rates in the world with almost every one in two marriages falling apart. This often leaves women struggling to raise children under extreme financial hardship. The single parent allowance, despite the temporary relief it brings, is merely a band-aid solution for these families. Economic emancipation remains unachieved. Meanwhile, women also continued to remain as a minority at state decision making level under Nasheed’s era. Any point in time, Nasheed’s cabinet were dominated by men and his female appointees made up less than a quarter of all political positions. His party followed same track, or even worse. Currently, women hold 5 seats in 77 member parliament and only 57 out of 1091 local councils. MDP secured full seats in the city councils of Addu and Male’ – two of the most populated areas – but none of them were sadly women. The party did not take any public initiative in encouraging female candidates to these elected posts. They simply embarked on making laws, building cities and running the state without an equal say of women who make up half of the country. But perhaps, this elections is a harbinger for change. This week, Nasheed sat down with women to listen to their woes. He promised that his economic and social policies are targeted, though not directly, towards addressing the most serious problems women face. Including housing, jobs, education and healthcare. However, he stopped short of promising women an equal representation in his government or party. Several women are throwing their support behind Nasheed because they also believe in the values of equality and justice he preaches. Perhaps, it needs to be put into practice a little better. A good place to start would be within the party itself. Mariyam Zulfa, who served as Tourism Minister during last months of Nasheed’s rule recently gave a subtle warning to MDP’s main rival, Abdulla Yameen of PPM. “Yameen please don’t have your eye on 2018, thats gonna be a year for women, we have waited patiently enough, like Hillary Clinton,” she posted on Facebook. This status echoes an important message – MDP women are ready to climb to the top rung of the political ladder. But, amid an environment of highly competitive and machiavellian men jostling for power, women often find themselves at crossroads. Whether to challenge the male dominance and risk losing or just be happy with the little voice she has. Choosing the latter also makes it easier to juggle the personal life often sacrificed by women pursuing a career. Shauna is one the few young women who has bravely made it to the top tier of MDP, and she shared the challenges women face on the field. “One of the reasons why we do not see women in elected posts is because women do not have access to campaign finance. We do not see many women in government senior posts because simply there is not policy that promotes it – working hours are not flexible for women with families, senior posts mean a lot of time and commitment. Working environment and hours do not give this women any flexibility. Harassment exists at all levels in the Maldives and there must be an end to that for more women to take up senior posts.” she explained. These are problems can be resolved by changing MDP’s current gender mainstreaming policies to a more direct women empowerment strategies such us quotas for women, setting up a budget for funding female candidates, running political leadership training programs. When more women take part in decision making, the diversity of opinions and ideas leads to better results in developing the country. MDP also has continued to voice against rising extremism and the resulting backlash in women’s role in public life. There is no better way in countering extremism than encouraging those subjugated by it to be free and exercise their power. Several women have already put their faith and support behind the party. It is time for Nasheed and his party to return the favour and let women have the equal space they deserves. Should MDP hesitate, it is bound to create rifts through its existing female support base. But for now, women cheering for Nasheed seems to have his back. The Supreme Court on Thursday ruled that contested decisions by parliament to remove Civil Service Commission (CSC) Chair Mohamed Fahmy Hassan and conduct no-confidence votes through secret ballot are unconstitutional. On December 3, 2012, parliament voted 41-34 to approve amendments to the parliamentary rules of procedure to conduct no-confidence votes to impeach the President and remove cabinet members through secret ballot. The house rules were changed with pending no-confidence motions against President Dr Mohamed Waheed and Home Minister Dr Mohamed Jameel Ahmed submitted by the formerly ruling Maldivian Democratic Party (MDP). In late November, parliament dismissed Fahmy in a 38-32 vote after the Independent Institutions Committee investigated a complaint of sexual harassment by a female employee of the CSC. Both moves were challenged at the Supreme Court, which issued injunctions or stay orders to parliament to halt both conducting no-confidence votes through secret ballot and appointing a replacement to the CSC, pending rulings on the legality of the decisions. In its judgment (Dhivehi) on the constitutionality of secret ballots for no-confidence votes, the Supreme Court ruled 6-1 to strike down the amendment to parliament’s standing orders as unconstitutional. The majority opinion contended that the move contravened article 85 of the constitution as well as parliamentary principles and norms of free and democratic societies. Article 85 stipulates that meetings of the People’s Majlis and its committees must be open to the public. In the second judgment (Dhivehi) on Thursday night, the Supreme Court noted that Fahmy was alleged to have committed a criminal offence and contended that the Independent Institutions Committee violated due process and principles of criminal justice procedure in dealing with the accused. The Supreme Court ruled 6-1 that Fahmy would receive two punishments for the same crime if he was convicted at court following his dismissal by parliament (double jeopardy). Following the judgment, Fahmy would be reinstated and compensated for lost wages since December 2012. Delivering the judgment, Supreme Court Justice Abdulla Saeed reportedly said that a person should be considered innocent unless proven guilty in a court of law and was entitled to protect his reputation and dignity. Meanwhile, Justice Ahmed Muthasim Adnan – the only Supreme Court justice with a background in common law – issued dissenting opinions in both cases. He added that the secret ballot would be taken at a sitting open to the public. Justice Adnan argued that an inquiry by a parliamentary committee into alleged misconduct would not be a criminal investigation. Therefore, he added, the oversight committee would not be required to prove guilt to the extent required at trial before making a decision. He further noted that parliament’s dismissal under the authority of article 187 and a possible conviction at a late date could not be considered meting out two punishments for the same offence. Following the injunctions issued by the Supreme Court in December 2012, MDP MP Eva Abdulla told Minivan News that the supremacy of parliament was at stake in the cases before the apex court. “By its actions, the Supreme Court is challenging the separation of powers that underpins the constitutional basis of governance,” Eva said. Meanwhile, Independent MP for Kulhudhufushi South, Mohamed ‘Kutti’ Nasheed, contended in his blog on December 12 that the Supreme Court did not have the legal or constitutional authority to issue the injunctive orders against parliament. Moreover, the Supreme Court “does not have the power to even accept those cases,” he wrote. Nasheed argued that decisions made by parliament could not be challenged in court except in instances clearly specified in the constitution, which did not include dismissal of members of independent institutions and amendments to Majlis regulations. The purpose of article 88 was to prevent parliament’s decisions being challenged or overturned, Nasheed said, as in the absence of such a clause the Supreme Court would become a “People’s Appeal Majlis” with supremacy over the house of elected representatives. “If every decision of the People’s Majlis is appealed at the Supreme Court in the manner that any judgement by the High Court can be appealed at the Supreme Court, then there is no difference between the People’s Majlis and the High Court,” Nasheed wrote. This was against the separation of powers envisioned in the constitution, Nasheed said, which vested legislative powers in parliament and clearly specified instances where its decisions could be challenged at court. Former legal reform minister Nasheed is chair of the Independent Institutions Committee. Asked by the Supreme Court to hand over minutes of the committee inquiry, Nasheed had refused. As we look back on this week’s celebration of Human Rights Day 2012, it is important to recall what, beyond the pageantry and back-slapping, this day really stands for. During the 30-year long dictatorship of President Gayoom, those of us who longed for a fair, just and democratic Maldives would mark Human Rights Day by wearing secretly-printed t-shirts to mark the occasion – printed in stealth, worn in stealth. We took this risk (open advocacy of human rights and political reform was liable to end with a jail-term) because Human Rights Day was, we believed, important – a moment to remember that the outside world stood steadfastly behind our hopes for a better future. It is therefore difficult, in 2012, not to feel a sense of disappointment – even shame – at what Human Rights Day has become, at least for Maldivians. Human Rights Day 2012 goes under the banner of “inclusion and the right to participate in public life”. Over recent days we have heard the UN Resident Coordinator encourage people to play an active role in public life and to hold public servants accountable (no word, however, about securing accountability for the systematic human rights violations that have occurred since February). We have heard the Human Rights Commission of the Maldives warn us that enjoying human rights should not be taken as an excuse to break the law (an unusual message for a national human rights institution to focus on – but not entirely a surprise). We have heard the Commonwealth Secretary-General remind the government (more in hope than expectation) that those responsible for gross human rights violations following February’s coup – mainly police officers guilty of beatings and torture – must be held accountable. And yet, these platitudes come against a background wherein, in 2012, the majority of Maldivians who voted in 2008/9 have been disenfranchised; wherein those of us who want a new election in order to reassert our fundamental right to choose our government are being routinely beaten, arrested and tortured, wherein members of parliament who have sought to protest against the death of our democracy are being hounded, threatened and chastised as infidels; wherein the presidential candidate of the Maldives’ largest party is being manoeuvred into prison by the ancient regime; wherein the man who stands accused of torturing many over his 30 years of dictatorship announces he is likely to be a presidential candidate, again, and wherein our corrupt and immoral judiciary is openly attacking parliamentary prerogative and the constitutional separation of powers in order to protect those guilty of sexual harassment, and to protect the government from democratic scrutiny. How is it possible that the UN, the HRCM, and our friends in the international community can let this year’s Human Rights Day pass without any mention of the dismantling of our democratic rights; without any suggestion that in 2012 we have lost, for the foreseeable future, our right to participate in public life and to determine, freely, our government; and without any meaningful call for those who have had their rights violated in 2012 to receive justice and redress? For those of us who weep for the lost promise of our young democracy; for those of us who flinch at every new injustice heaped upon us; for those of us who wish our former friends in the international community would stand-up for the rights and principles that they purport to uphold; Human Rights Day 2012 will be remembered as nothing more than an empty shell. Not even worthy of a hidden t-shirt. Eva Abdulla is an MP in the opposition Maldivian Democratic Party (MDP). I have read with concern a number of articles and commentaries over recent weeks which appear to be based on two false premises: first, that the Maldives judiciary is independent and impartial; and second, that it is capable of delivering a fair trial to the democratically elected President of this country, Mr Mohamed Nasheed. Neither premise holds-up to careful scrutiny. The first false-premise, which is regularly put forward by members of the Government, especially Dr Hassan Saeed, as well as by the Maldives’ own ‘independent’ UN Resident Coordinator, Mr Andrew Cox, appears to be based on a misguided reading of the concept of ‘independence’. In essence, this misreading holds that if our Constitution says that the judiciary is ‘independent’ then it must be so, irrespective of what the on-the-ground reality tells us. The 2008 Constitution does of course establish a separation of powers and makes clear, in article 142, that “judges are independent”. But just because the Constitution says this is so, does not, of course, magic the situation into existence. What the Constitution also does therefore is set up mechanisms to ensure judicial independence, impartiality and integrity. It therefore makes clear that all judges will, under the new Constitution, be subject to a reappointment process (article 285) and that to be (re)appointed, judges (article 149) “must possess the educational qualifications, experience and recognized competence necessary to discharge the duties and responsibilities of a Judge, and must be of a high moral character”. Central to this process is the Judicial Services Commission (JSC), which is responsible for both the (re)appointment process and for upholding the impartiality and integrity of judges including by listening to complaints and taking “disciplinary action” against them if necessary (article 159b). The importance of these mechanisms is clear when one recalls that all judges at the time of the entry-into-force of the new Constitution had been appointed by, and owed their loyalties to, former President Gayoom during his 30-year rule. However, as Aishath Velezinee, President Nasheed’s former member on the JSC, has demonstrated in her book “The Failed Silent Coup”, former President Gayoom succeeded, through securing a post-election de facto majority in the Majlis, in controlling the appointment of members to the JSC and thus of controlling the JSC’s reappointment and disciplinary procedures. As a result, despite ample evidence of some judges possessing neither the competence, qualifications nor moral character to be reappointed, the JSC quickly moved to swear them all in, arguing that the criteria laid down by the Constitution to control reappointment were only “symbolic” . When Velezinee objected she was manhandled out of the room. In the years thereafter, the JSC compounded this failure by refusing to process any of the multiple public complaints it received against Gayoom-era justices. When, in 2011, it finally bowed to public pressure and recommended disciplinary action be taken against Judge Abdullah Mohamed, a man accused of serial wrongdoings over many years, the judge in question simply asked his friends in the Civil Court to annul the proceedings. When the Civil Court did so, it removed the last pretense that the Maldives’ judiciary is independent, impartial or accountable. As of that date, the Maldives’ judiciary became a failed institution. So what of the second premise: that such a judiciary is capable of delivering a fair trial to President Nasheed, who is ‘accused’ of arresting Judge Abdullah Mohamed after the judge used his friends in the Civil Court to circumvent the Constitution and then used his position in the Criminal Court to repeatedly free not just allies of former President Gayoom, but also a number of known criminals? Here, it is perhaps worth turning to respected international experts, international organisations and NGOs which have studied the Maldives judiciary and the justice sector more broadly. The systematic problems facing the judicial system have been widely documented and were perhaps best summed-up by legal expert Professor Paul Robinson who advised the Maldives on judicial reform. In his 2005 report, he characterised the Maldives criminal justice system as “systematically failing to do justice and regularly doing injustice”. One of Professor Robinson’s main recommendations – to conduct a complete overhaul of the country’s archaic Penal Code – remains unimplemented. As a consequence, the Prosecutor-General is insisting on prosecuting President Nasheed on the basis of a Code drafted in the 1960s and which is based on a document produced in India in the 19th century. In February 2011, the International Commission of Jurists (ICJ) visited the Maldives and issued a report which echoed many of Professor Robinson’s earlier concerns and demonstrated that, irrespective of the new Constitution, little had changed. In its report, the ICJ expressed concern at “the apparent failure of the JSC to fulfill its constitutional mandate of properly vetting and reappointing judges” as well as the “judicialisation of politics”. “The JSC”, according to the ICJ, “was unable to carry out its functions in a sufficiently transparent, timely, and impartial manner”. The ICJ concluded that the complete lack of judicial accountability in the Maldives undermines public confidence and calls into question the institution’s independence. In July 2012, the United Nations Human Rights Committee considered the state of the Maldives judiciary. In its concluding statement, the Committee said it was “deeply concerned about the state of the judiciary in the Maldives”. “The State has admitted that this body’s independence is seriously compromised” noted the Committee, which called for serious reform of the Supreme Court, the judiciary more broadly and the Judicial Service Commission. These findings were mirrored by both Amnesty International and the International Federation for Human Rights (FIDH) in late 2012, following their visits to the Maldives. For example, FIDH in its report “From Sunrise to Sunset” on human rights in the Maldives, noted that despite important constitutional changes, “different sections of the judiciary have failed to become fully independent”, while pointing out that the JSC lacks transparency and its members are prone to “conflicts of interest”. With the above in mind, it is difficult to understand how members of the government or some parts of the international community can claim with any degree of sincerity that our judiciary is either independent or capable of delivering a fair trial for President Nasheed or the hundreds of other Maldives Democratic Party (MDP) members currently facing prosecution for “terrorism” and other trumped-up charges. If justice is indeed blind, then why are hundreds of MDP supporters awaiting trial, while not one police officer or member of the current government has been held accountable for the widely-documented brutality unleashed against protesters since February 7? And if justice is indeed blind, then why are cases against MDP supporters being fast-tracked while there are over 2000 other cases pending with the Prosecutor-General? Why have all the serious corruption cases against Gayoom’s political allies been either sidelined or discontinued? Perhaps the most damning indictment of the Maldives judiciary is that, at this time of political division, it is the one subject about which nearly everyone in the country can agree. Whether you are for President Nasheed or against him; whether you think February 7 was a legitimate change in government or a coup, nearly everyone – at least outside the President’s Office – agrees that our judicial sector are not fit for purpose. And yet it is this deeply flawed institution, wielding a two hundred year old legal code that is supposedly able to deliver a fair trial for President Nasheed. Over recent years, we have achieved much. We have amended our Constitution, embraced party politics, held our first free and fair elections, voted-out a 30 year old autocracy and voted-in our first democratically elected leader. But the judiciary has failed to come even close to matching this pace of change and remains, by-and-large, the same institution as it was during the Gayoom era – unreformed and unrepentant.